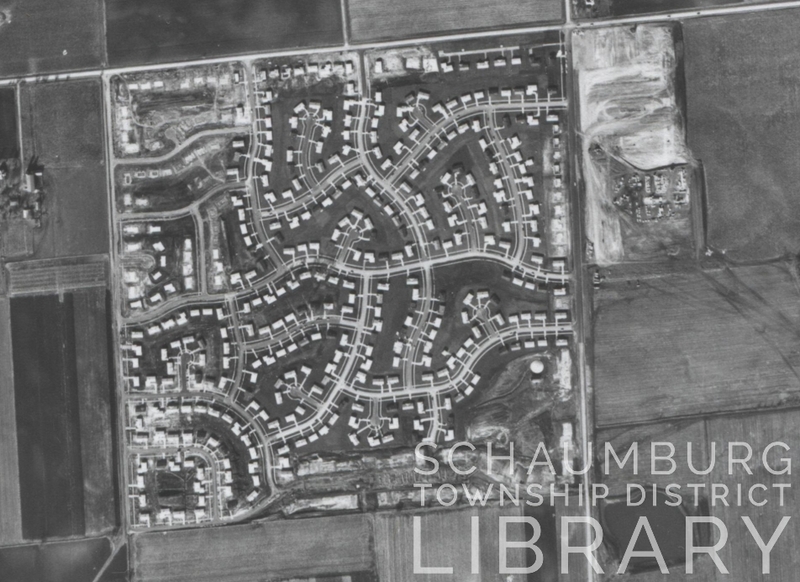 The southeast corner of Schaumburg and Springinsguth roads, sight of the first Schaumburg Jewel, seemed the perfect spot for the small festival that was planned for Sunday, September 10, 1961. It was a flat parcel in the center of the new Weathersfield subdivision and within easy walking distance for many of the attendees. You can see it as the large, graded spot in the upper left portion of this photo. The newly formed Schaumburg Lions Club named it the Chuck Wagon Jamboree and designed it for all residents of Schaumburg Township. Tickets were available from all Lions Club members, at the Golden Acres Country Club and Roy’s Standard Station on Schaumburg Road near Roselle. Mayor Bob Atcher was, of course, the featured entertainer as well as the Art Van Damme Quintet, a jazz group, The Four Horsemen, a barbershop quartet and the Lions’ own German band. The mayor appeared dressed in his full two-gun cowboy dress riding Chief of Police, Martin Conroy’s horse around the area. A beef barbecue dinner for the cost of $1.50 was also held. Amazingly enough, the event was held from noon until midnight. Expecting the event to be an annual affair, the Lions planned another Jamboree the following year in 1962. The second year was quite a major affair, expanding to the three days of the August 24-26 weekend. 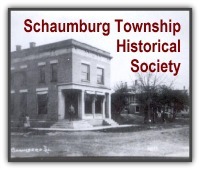 It included a western style dinner, a liquor booth with nickel beers, a full carnival and a Saturday night dance for the Schaumburg Teen Club featuring “The Vistas.” Mayor Atcher was, again, one of the star performers. Unfortunately, a rain storm on Friday night turned the area into a “sea of mud” as reported by the Hoffman Herald, forcing the Lions’ members to create wooden walkways to keep everyone from sinking. This may have been enough to convince the Lions that they’d rather not take on such a big project because there is no further mention of the Chuck Wagon Jamboree. By 1968 the Shindig was sponsored by the Fire Department itself. This year, though, the event included a parade that wove its way through the Weathersfield subdivision, east of Springinsguth. The parade included a kids’ bike parade, ten clowns courtesy of the Jaycees, the 4-H club’s six horses and the Schaumburg VFW drum and bugle corps. In 1969 there was a “Miss Shindig” contest. The queen was determined by penny votes cast in stores throughout the Weathersfield Commons Shopping Center. Kathy Rabe, who was declared the queen at a special dance at the Schaumburg Great Hall (The Barn), rode in the parade with all of her attendants. 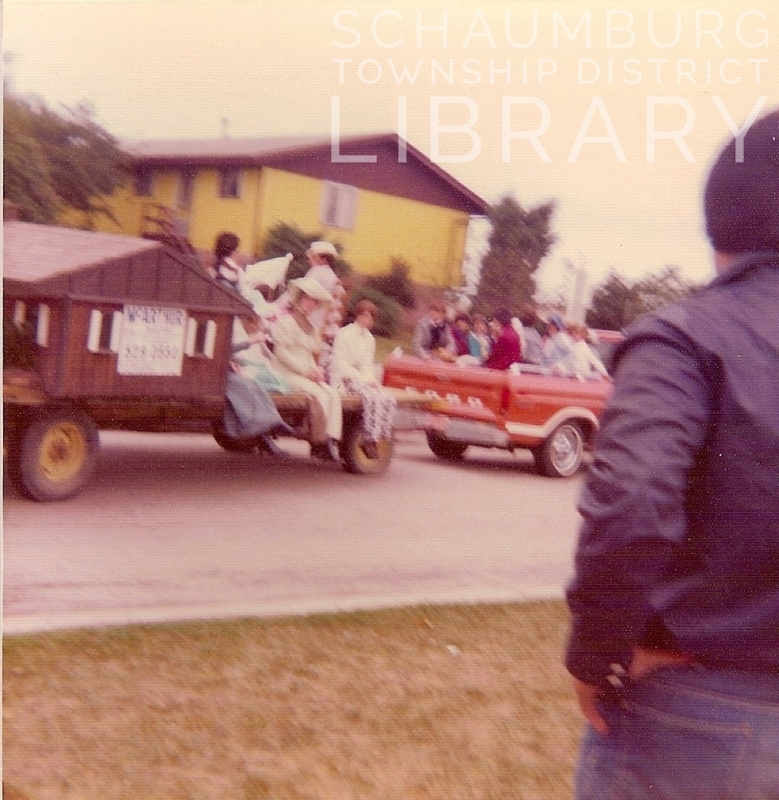 1970 saw floats added to the parade, courtesy of the Schaumburg Park District and the Schaumburg Woman’s Club. Water fights were also held, courtesy of the Fire Department. A dance, featuring music by The Sound System, a local band from Hanover Park, was the culminating event on Saturday night. 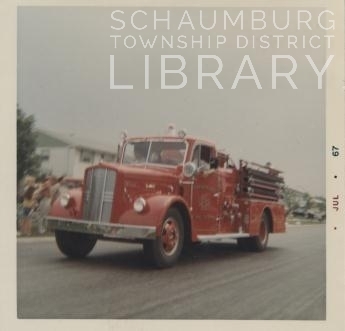 The following years saw an all-star baseball game featuring players from the teams of the Schaumburg Athletic Association (1971), marching units in the parade from the Army and Marines (1972), and the parade route changing from Braintree to Springinsguth (1973). The big change in 1974 moved the Shindig from July to the month of October. The number of musical groups also grew to four with the Jimmy James Banjo Band, Skadarlife Yugoslavian Band, Weaver Hammond Organ and Segments of Sound. In the growing village of Schaumburg, the need for entertainment and the growing number of service organizations worked hand in hand to produce wonderful days to look forward to. After all, who here doesn’t remember being a kid and biding your time for that big picnic, carnival or festival that promised so much fun? The carnival and the rides? The eating? The drinking? The parade? Attending was great and participating in some way was even better. Thank goodness for those entrepreneurial spirits who organized these days of fun! My thanks to Diana Dobrovolny for being the inspiration for this posting. I knew about the Shindig but had never heard about the Chuck Wagon Jamboree. Your pieces of history count!